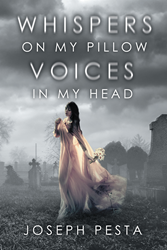 Recent release “Whispers on My Pillow Voices in My Head” from Page Publishing author Joseph Pesta is an emotionally charged narrative that resonates feelings of love and loss that is sure to touch the reader’s heart. Joseph Pesta, an insightful writer and author, has completed his new book “Whispers on My Pillow Voices in My Head”: a substantive compilation of original poems that tells a deeper apologue worth pondering upon. Published by New York City-based Page Publishing, Joseph Pesta’s heartrending account reveals the poignant recounting of the past, present, and future, where emotions build up, and love is spoken and felt despite the tragedies and disappointments one encounters in life. Readers who wish to experience this exquisite work can purchase“Whispers on My Pillow Voices in My Head” at bookstores everywhere, or online at the Apple iTunes store, Amazon, Google Play, Kobo, or Barnes and Noble.